On Jan. 27 each year, the United Nations remembers the Holocaust that slaughtered people of Jewish origin during World War II. The day also commemorates the liberation of the Nazi death camp Auschwitz-Birkenau in Poland on Jan. 27, 1945. We know the truth today, but less remembered are at least 38 million Chinese people killed by Mao Zedong. And hardly recognized until recently by the international community has been the systematic persecution of Falun Gong—benign, Buddha-school qigong spiritual exercises, once practiced by 70 million–100 million in China—and subject to a genocidal persecution since 1999. I quoted Judge Frankfurter in an article I wrote for my regional newspaper, the Yorkshire Post, on my return from a fact-finding visit to China in 2006. I have written many similar articles since. As European Parliament Vice President for Democracy & Human Rights, I met former Falun Gong prisoners of conscience secretly in Beijing. One of them told me that his buddy had disappeared from their prison cell and the next time he saw his body in the prison hospital with holes where evidently body parts had been removed, for sale. A resolution by the European Parliament on Dec. 12, which I sponsored, unequivocally condemned the Chinese regime’s organ harvesting, especially from Falun Gong prisoners of conscience. The same week, a U.S. congressional committee adopted a parallel resolution, and a 1.5-million signature petition was presented to the United Nations. These actions are ending the credibility gap about the genocidal crime of selecting and killing prisoners, especially Falun Gong practitioners, for body parts. They are the only prisoners in China to be blood- and urine-tested as part of the selection process, and thousands have been tissue-matched and then literally killed to order at 1 of the 169 transplant centers across China. Some 10,000 operations are carried out each year and the organs mostly come from prisoners, because organ donation hardly exists in China, for cultural reasons. I have campaigned against this appalling crime against humanity since my visit to Beijing in 2006. After my visit, Gao and I kept in touch about reform in China but he was arrested on Aug. 15, 2006, and was later convicted of “subversion” and suffered a series of imprisonments, house arrests, and then—for a long period—disappearance. According to press reports, members of his family finally made contact with him in January 2013 at a prison in Xinjiang Province. Fortunately, his wife, whom I met in Washington in March 2013, son, and daughter were spirited to the United States. On Dec. 2, 2012, I opened the latest in a series of hearings on human rights in China at the European Parliament in Brussels with a plea for the release of Gao, amplified by a video testament from his daughter Gege. This activity is contrary to Article 2 of the Genocide Convention. I am campaigning for an international register of those who torture and kill to be maintained for future prosecutions under the International Criminal Court. These can only be done once China is free. Unlike China, the European Union is a democracy. On May 22–25 elections are held across the EU, including in my region, Yorkshire & Humber. I have changed parties (I became a Liberal Democrat in 2010 when the Conservative Party became too anti-European) but I hope to be re-elected to continue for another five years to spread the truth about the persecution and killing of Falun Gong practitioners from the European Parliament. 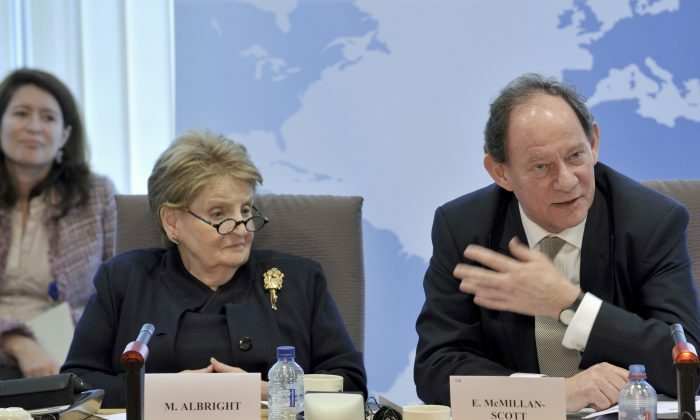 Edward McMillan-Scott, Member of the European Parliament (UK Liberal Democrat), is vice president of the European Parliament for Democracy and Human Rights.